Empress Saint Mina rules with a just hand and pure heart. I am Saint Mina and I am here to tell you a little about my fast growing Empire, so enjoy your reading of my Empire and please, leave a comment and if you like, give Karma too! 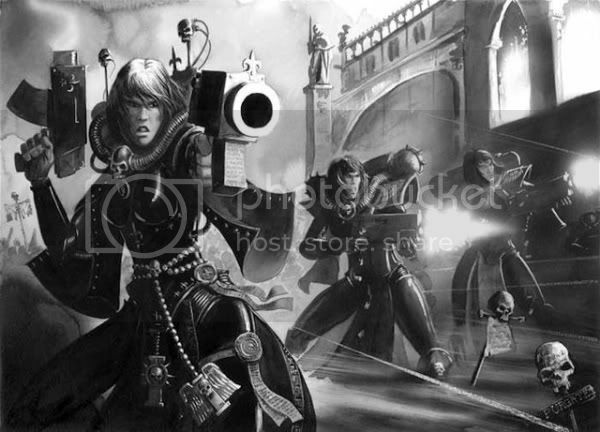 Orders Militant of Adepta Sororitas are female warriors of the Ecclesiarchy, a religious inquisitors that bear a resemblance to several Knightly Orders from Medieval Europe, and have a strong Gothic appearance of the Imperium to the extreme feel. Many of their heroines have the personae and attitude of Joan of Arc (especially in Martyrdom and Sainthood). Being an elite army of female zealots, they also bear some resemblance to the Fish Speakers from Frank Herbert's Dune universe. 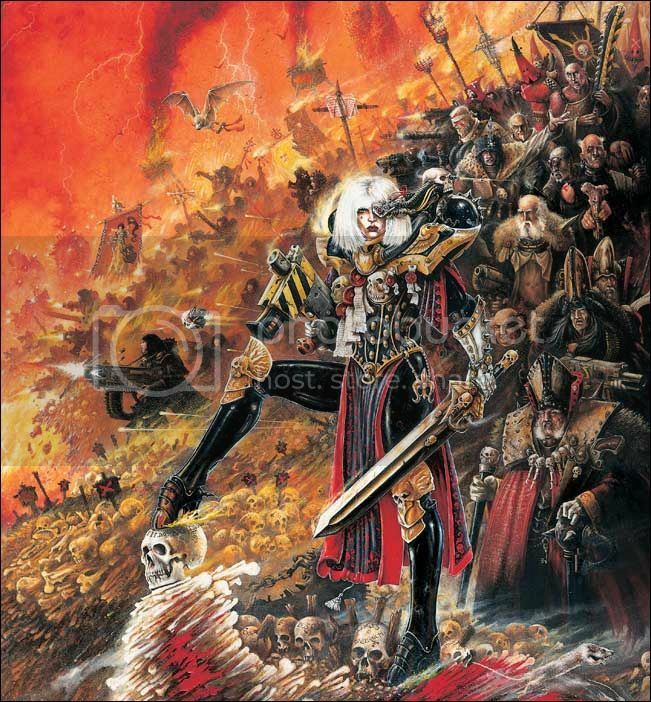 Ruthless are the Adepta Sororitas in their pursuit of punishing all forms of blasphemy with a harsh, but just, sentence and though thousands of innocents may be sacrificed to achieve their goals, these are negligible losses when the price of failure is so great. 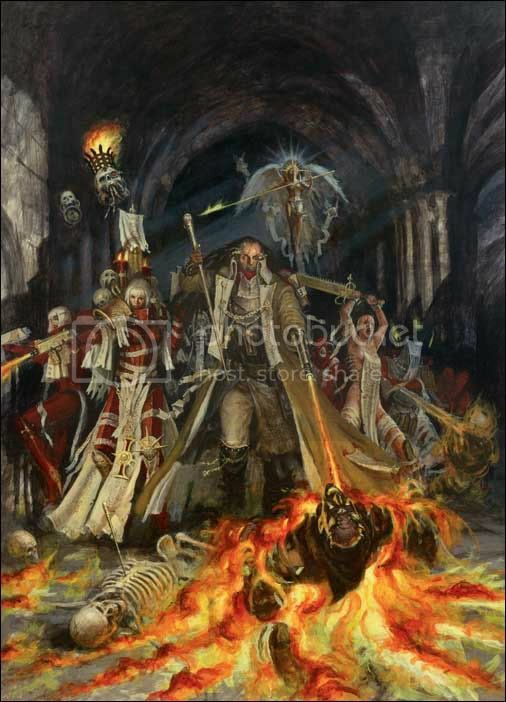 Their primarily concerned with seeking out and purging heretics and rogue psykers, viewing them as unclean abominations. Their intense zealotry allows them to channel their own will into devastating abilities called Acts of Faith, allowing them to quickly turn the tide against dangerous adversaries. 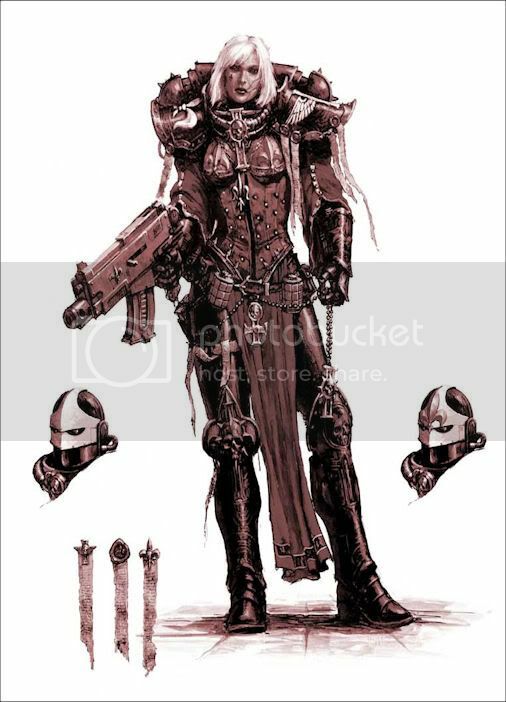 In addition, Adepta Sororitas can start their campaigns with First Strike abilities, allowing them to quickly form a strong presence on the battlefield or solar system early in the war. Devotional scripts and declarations of the bearer’s sanctity, many ecclesiarchal warrior wears purity seals to further protect them from the taint of the impure. Each seal is a benediction against the forces of Chaos, Mutations and deliverance from the impure. When they join the fray they tend to favor heat and flame-based weapons for their purifying effect. This makes them especially dangerous to infantry units, who crumble easily in direct assault against the Adepta Sororitas. 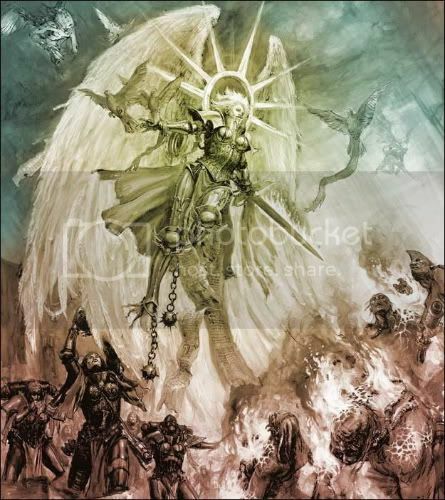 Finally, the Adepta Sororitas can call upon their Living Saint Mina, a venerated warrior borne on wings of purity who smites the heretics with bursts of Holy Flame. Every Empire has a hero and Sister Mina had a reputation for being fierce, mysterious, and deadly in battle. She was murdered by a blood cult, whose agents had attacked her while praying. Her body was found along with the shrine, covered in the blood and the corpses of fifty of her attackers. Her symbol, the red rose, represents her strong character and her final death. Thus, Order of the Bloody Rose was created to honor her spirit and her Martyrdom. Rejoicing of this ascension of Sister Mina to Saint Mina of Ophelia VII has brought Order because a Living Saint is an avenging angel, a terrible and wondrous being to witness, for they shine with the purest of light, and bring death and destruction to the impure. It is also the case that one who burns twice as bright burns half as long, for no human can wield such power indefinitely. Hence the title ‘Living Saint’ – for at her ascension, the individual is already martyred, her death a self-fulfilling prophesy. And there you have it, the birth of the newest Empire. In Metaverse, we are holding onto 4th place and now 3rd place is looking very, very far away, and that is why we need your help! In Mod Metaverse, we are in 1st place. In AltMeta, we are holding onto 2nd place but if 1st place falls alseep, we will take it. We are looking for players to join to become aggressive Admirals to lead your Fleets across the galaxy. I will accept the bravest of hearts from both male and female, so if you pledge your alliance to be apart of something bigger than just another underdog then it must become your Empire too! Good Hunting and click on the link below to join! We are looking for players to join to become aggressive Admirals to lead your fleets across the Galaxy! The Geckodon Alliance welcomes this new prey race, your warriors will soon learn to fear the mighty claw that is the Geckodon Alliance. Emperor Seth, we might become your prey now but we know no fear because zealots are not afraid to die a warriors death so when are numbers grow ,you can either work with us or be purged by Holy Flame like an abomination. A new Empire that believes in the Light? This could case political disruptions in the Confederation... But i am not worried, Welcome friend as Ambassador and leader of the United Confederation of Planets a Confederation detected to bring peace to this area and bring down the evils of the Galaxy, we look forward to seeing each other in the future. Only in your drems, for here in the Metaverse, evil will always be on top. you can either work with us or be purged by Holy Flame like an abomination. It willl be you who will be purged by the mighty claw of the Geckodon Alliance for not only are our warriors strong but our ships also, our ships are the most powerful ones in the galaxy. Just to note "good and rightous" people, good and evil is but one's opinion. The only people who consider themselves as evil are those who know what they do is wrong, yet do it anyway. Back on the Terran's planet there are those of various religious bent that beleive the other is evil, only due to their actions against them. All however, consider themselves as the bastions of good in their world. Who is right, who is wrong? I, a Kzin warrior not by blood, but by choice don't consider myself as "evil" for the acts I do. A fallen warrior's flesh would be such a waste for the vultures, especially if they put up such a good fight. As for the Aul incinerators, another perfectly good resource that would go to waste upon one's death, why not harness it for the sake of the empire? funney and i am a Ramulan in Valcan discise. @Freeman, If I bring anything to the Confederation is balance because all evil is Chaos and thier is no balance. I bring Order [e digicons]O:)[/e] to the Chaos [e digicons]} [/e] and evil brings Choas [e digicons]} [/e] to my Order [e digicons]O:)[/e] . It is a cycle of Order and Chaos like Yin and Yan or Life and Death. Purity and Abomination if you are not neither than you are a Neutral balance point for both to be used by both like a pawn in a chess game. @Seth, Yes evil will be on top for now but not forever. A purge is coming so what side are you on? [e digicons]8C[/e] Oh by the way my ships are powerful too and I know how to use them and when too! The Battleship BB-Moon-Jp - 14559 has over 400 attack base?, over 100 defense base? and over 300 hit points base? and I am making a another post to show a battle I won with just this one battleship against 6 other high tech battleships. @Loupdinour,Ok [e digicons]:thumbsup:[/e] if you say so. @Seth, Yes evil will be on top for now but not forever. A purge is coming so what side are you on? The side that's strongest, evil. @Seth, Then you have nothing to worry about today but the future is unseen so be mindful young one. I have seen the future, also the Geckodon Alliance has been conquering the stars longer than you. Yes, you have been conquering two years longer than us. The Geckodon Alliance has been conquering worlds for over 1,900 years. Loupdinour, you couldn't resist could you? neither can i.
evil are those who know what they do is wrong, yet do it anyway. well, that's me.. these Adepta Sororitas sound hot.....are any available this weekend? i prefer pairs. Loupdinour, you couldn't resist could you? I just love to urinate in one's circular wheat breakfast when I hear someone 'thinks' they are the good guy in town. @Seth, did you get your data? You have been a member for two years that is what I meant and your Empire's Total Regin is 520 years and my Total Regin is 133 years on Altmeta. @Jacklv, and yes we are hot if you like being purge with Holy Fame. @Loudinour, I didn't we say are good, we bring Order [e digicons]O:)[/e] to Chaos [e digicons]} [/e] . Been sometime since we unleashed a Rosie Clone on someone. @Neilo, Aaaaaaaaa run away [e digicons]8O[/e] run away [e digicons]8O[/e] like in Mighty Python's Holy Grail. You have won this battle and the nightmares of this haunt us for along time. [e digicons] O[/e] Well, not that long! The Rosies are indeed a shocking sight to behold. Each seal is a benediction against the forces of Chaos and deliverance from evil. If you are to deliver someone from Evil, you must be Good. To call yourself "neutral" it only means you have a mental imbalance in that you know you do some things evil, but you do it to be good...which in the end still makes you evil. One step over that line in and you're evil. As for your hatred for Chaos....now there I can relate. I cannot WAIT to see you're soldiers on the battlefeild and see what their flesh tastes like!!! For if you dislike Chaos, I am quite the poster-boy. First thing i did too. Ahem, it's been awhile since I posted anything about the MV Mod, so here is some news, ok, the Colonial Fleet won't be appering in the mod, in their place will be the Adepta Sororitas. Secondly I am accepting ideas for events. please send me a PM to me with the following. NOTE: Your even must be serious so no Rosie Clones or anything like that. Please disregard our empire motto, as our universal translator may not have assimilated all the nuances of your language, which may result in some mistranslations. A feast, kool, celebration, Yea! You are alright. We will bring the white capnit for you [e digicons]:grin:[/e] . We know what you are doing but we can't doing about it because our generals are not too smart. Does that sound familiar. It will be quite a satisfying festival then. We await your imminent arrival with open jaws.